"I've recorded with so many amazing artists in my career, but never on a duets album all my own. 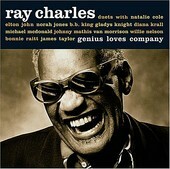 I thought it was time to have some of the friends that I love and the artists that I admire come into my studio and sing with me live," states Ray Charles on the inside of the digi pack for his latest album, Genius Loves Company. It is his first-ever record to go platinum in his 50 plus year career, and the latest record since his death. Dueting with Norah Jones, James Taylor, Diana Krall, Elton John, Natalie Cole, Bonnie Raitt, Willie Nelson, Michael McDonald, B.B. King, Gladys Knight, Johnny Mathis, and Van Morrison, Genius Loves Company offers up many magical moments. Charles is on the top of his game, delivering a poignant performance track after track, covering songs by the artist he is dueting with, as well as re-making some of his own hits. No matter who he's singing with, the magic is there, the piano-based adult contemporary pop rich with soul. And with plenty of musicianship to carry it off, each song sounds pristine, majestically floating from one hit to the other. Each song soaked in a timeless quality, the re-make sounding as good, if not better than the original, the duets a stunning collaboration that help breathe new life and importance into each of the numbers. Ray Charles went out on top, still crafting songs that will long outlive us all, songs that will never be forgotten as long as music is a vital part of life, and so he may be gone, but his memory and legacy will never die. Genius Loves Company is just another testament to this, to his influence, and to his ability to play with anyone and make it sound so natural, you can't imagine how it hadn't happened until now. I'll give this an A-.